What are The Ideal 2 Person Hot Tub Dimensions? A hot tub is the ideal place to wash away the stress of the day, or to share some relaxing and intimate moments with someone you care about. If you are considering a hot tub then you may want to know the average dimensions of these relaxation spas so you can determine where to place it on your deck or patio. You will basically have three sizes of hot tubs to choose from. The smallest hot tubs are designed for an occupancy of two to four people, the medium size tubs are designed for an occupancy of five to six people, and the largest hot tubs are designed for an occupancy of seven or more people. The small hot tubs designed for two to four people to use are between 5’4” and 7’ in length depending on the manufacture and design of the spa tub. These tubs will be between 5’4” and 6’8” wide depending on the manufacturer and the design. These tubs will be between 29” and 35” in height depending on the manufacturer and the design. You will want to consider how many people will use the hot tub at one time, and the height of the people who will be most likely to use the hot tub. You also have to consider the amount of space you have to place the hot tub in. You want the tub to fit properly in the space you have, and you want it to look attractive, so your dimensions of the area where the unit will be established are going to play a key role in the dimensions of the tub that you select. 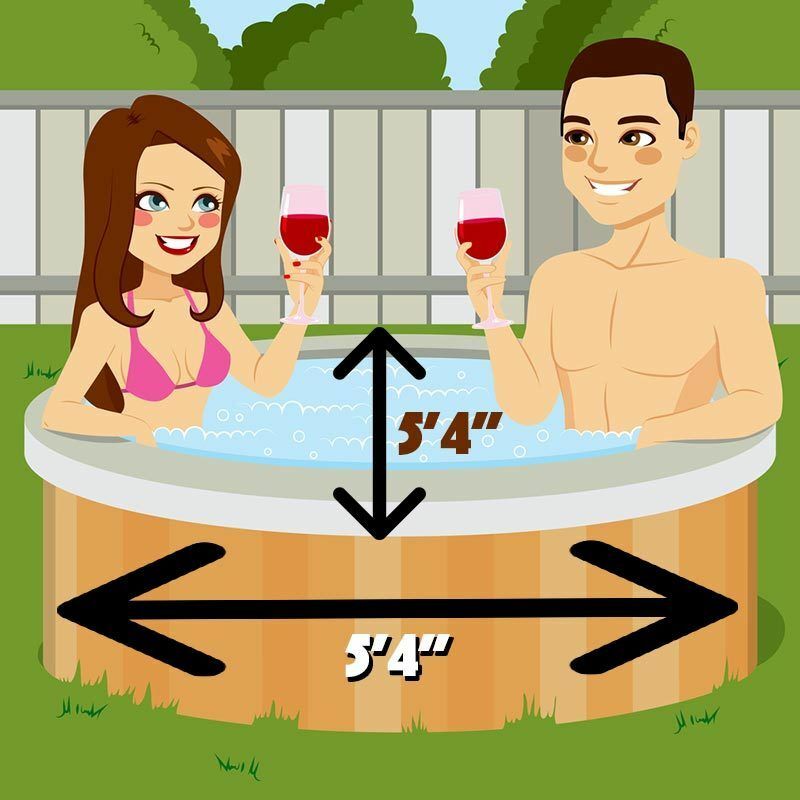 If you want a cozy 2 person hot tub that will accommodate only two occupants you should shop for one that is 5’4” in length, 5’4” in width and the perfect height of the tub will depend on the height of the tallest person that will regularly use the tub. If you are taller than average then you may want to consider a hot tub that is longer and wider than the average tub. You want to be able to sit in the tub with your legs fully outstretched and be comfortable. The shorter hot tubs may be uncomfortable for taller individuals. Taller individuals will want their hot tub to have a greater height so they can comfortably sit in the tub and have water that comes to their chest when they are sitting. Shorter people will not want their hot tub to be as deep because when they sit down in the tub they do not want the water level to come too high on their bodies. Couples who have a short and a tall person need to have the shortest person sit on the floor and measure them to see what depth of hot tub they could comfortably sit in. The size of the area that you have for the tub is not the only consideration you have in where to install the unit. You must consider the foundation that will support the hot tub as well. The hot tub weight will include the weight of the unit plus the weight of the water that is placed into the unit, and when people are in the unit their weight will add to the total weight that must be supported. One gallon of water weighs eight pounds and the average small hot tub holds four hundred gallons of water. That is three thousand and two hundred pounds of just water. If you decide to install a hot tub on a wooden deck or patio you need to make sure the deck can support a minimum of one hundred and twenty five pounds per square foot. If you are uncertain how much weight your current deck or patio can support it is suggested that you go ahead and reinforce the support systems where the hot tub will be placed. This is a safety precaution that can save you a lot of money and grief in the future. You can also have a carpenter come to your home and check your deck system to see if it is adequate to support the weight of a hot tub. It is never recommended for a large hot tub that can seat seven or more people to be installed on a wooden deck or patio. The larger units should be installed on concrete slabs that are a minimum of four inches thick.